To celebrate the beginning of the summer, my friend threw a party and served this amazing summer salad. When I asked her how she made it, she said that she basically threw together some ingredients that were in her fridge. The salad was very fresh and juicy and like a fusion of a greek and fruit salad. It is one of the best salads that I’ve had in a long time and I will be definitely taking this to my next bbq. Combine the ingredients in a big bowl, toss and serve. What a brilliant salad idea!!! 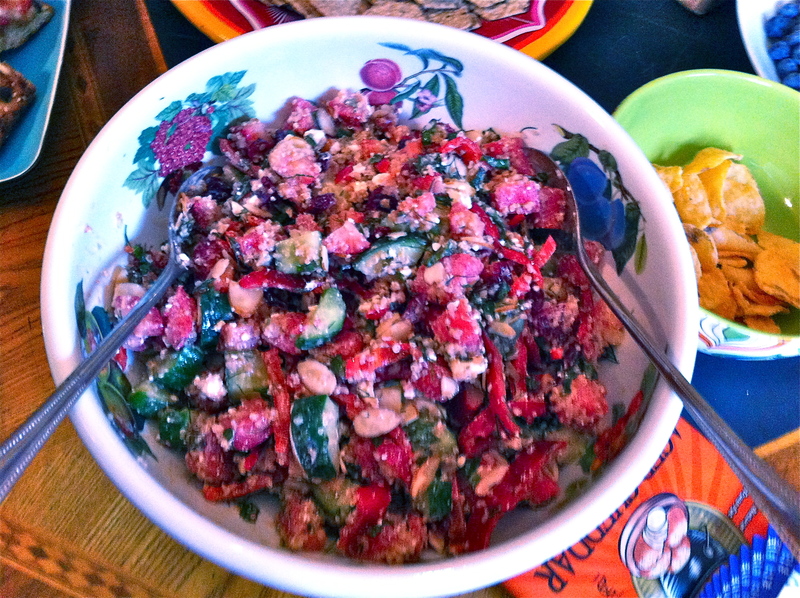 I often do “everything in the fridge soup” but never have heard of such a wonderful summer salad mixture. Bravo to Paula and thanks for this Lily!!! Thanks for sharing Lily, so glad you enjoyed! You are currently reading Pola’s Summer Salad at Coriander Kitchen.